Don't look around, but the corporate and political powers that be want you to put this book down, right now. It definitely is NOT on their approved list. 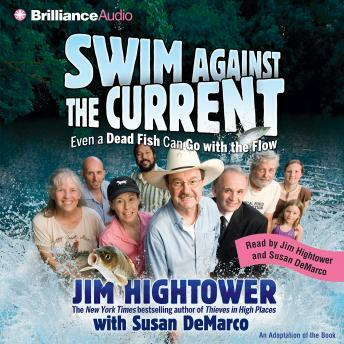 Swim against the Current is one of those books that the power elites don't like seeing in stores, much less in your hands - not merely because it challenges their established order, but especially because our book reveals paths that folks like you can use to escape their rigid, hierarchical structures and discover a bit more satisfaction in life. They prefer that you pick up one of those escapist novels over there across the store, rather than finding out that the greatest escape of all can be from stultifying conventional wisdom. We Americans are constantly harassed into thinking that we can't break the mold that those in charge have made for us. But as a friend of ours puts it: "Those who say it can't be done should not interrupt those who are doing it." It's the uplifting stories of mavericks that we tell here. They've broken free of the corporate tentacles, free of business-as-usual politics, free of top-down elites. They're figuring out new ways to do commerce, ways to create political channels that empower grassroots Americans, and ways to live their lives. As these folks show, resistance is not futile . . . it's fertile. Join the fun! Happy listening!